The RPF is served at the same time as other messes and is itself a constituted mess and must have a Mess President. It may not be served bread and eggs on the plea that other food is gone. Even if certain crew members as individuals wish to succumb, they have no right whatever to threaten or harm others by grave omissions, ignorance and errors. No one challenges the right of an individual to succumb. But he has no right to injure or murder others by omission or commission. The RPF is in actual fact a system of recruiting by taking people off the lines who are blocking things and then not letting them back on lines until they are a valuable operating staff member. When somebody goofs up badly and he’s stopping lines and so forth, move him over to the RPF and get him off the lines—even tech lines. That has the virtue of letting the crew itself go on up to OT. Not all the time is being invested in those goofing badly. So they will move up the lines as they wish. But that gets them off the lines.We now fill in the lines with non-R/Sing people and we can keep building it up and we will build it up toward an OT ship. That’s how it was figured out with that combination so the scene could be changed, and it worked. There were actual products coming out after that. You sometimes don’t get this done because you don’t have anybody standing by to feed in. So you also have to get some recruits in to make this operate. 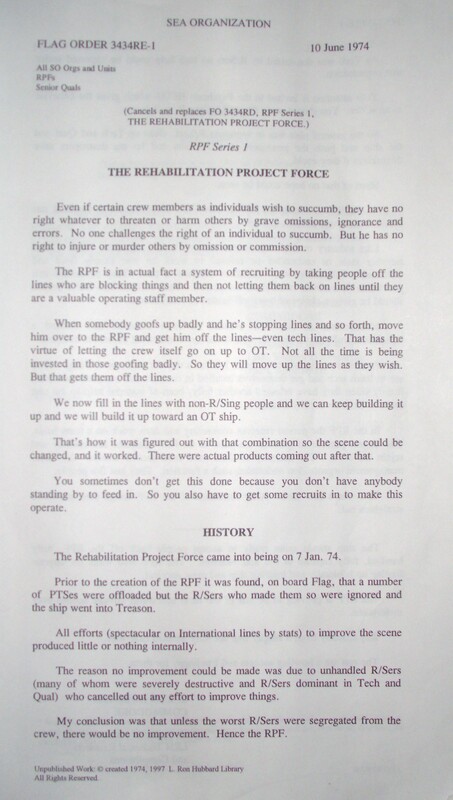 The Rehabilitation Project Force came into being on 7 Jan. 74. Prior to the creation of the RPF it was found, on board Flag, that a number of PTSes were offloaded but the R/Sers who made them so were ignored and the ship went into Treason. All efforts (spectacular on International lines by stats) to improve the scene produced little or nothing internally. The reason no improvement could be made was due to unhandled R/Sers (many of whom were severely destructive and R/Sers dominant in Tech and Qual) who cancelled out any effort to improve things. My conclusion was that unless the worst R/Sers were segregated from the crew, there would be no improvement. Hence the RPF. All Tech was dominated by R/Sers no tech help could be expected under that organization. Your attention is invited to the Psychosis HCOB which gives the behavior of an R/Ser.2 You should study this and believe it, as it is true. So the general plan was to segregate R/Sers3, clean up Tech and Qual and the ship and push the producers into OT state and let the destroyers save themselves if they could. Short of that no hope could be seen. To the RPF are assigned R/Sers, low OCA4 nonproducers or repeated stat crashers and overt product makers. Like industry or any organization or ship before that date, when a crew member stole or embezzled or refused to work he was simply fired and offloaded. Scientology crew members objected to this. They demanded that provisions be made to rehabilitate the person. 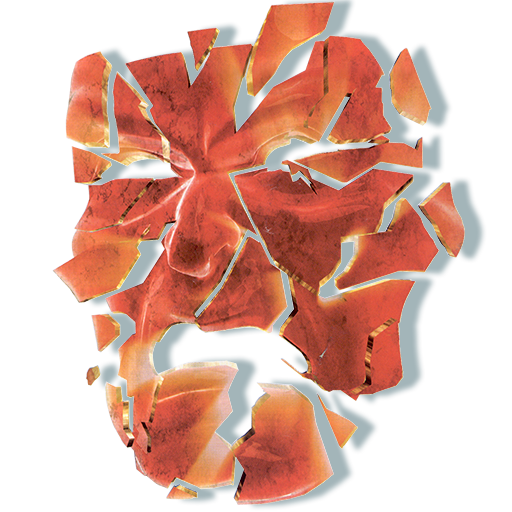 They had the idea that a person should be given a choice of being off-loaded or rehabilitated. 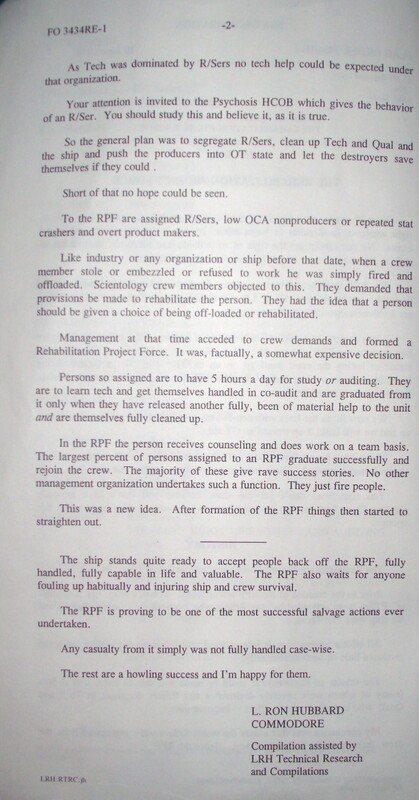 Management at that time acceded to crew demands and formed a Rehabilitation Project Force. It was, factually, a somewhat expensive decision. Persons so assigned are to have 5 hours a day for study or auditing. They are to learn tech and get themselves handled in co-audit and are graduated from it only when they have released another fully, been of material help to the unit and are themselves fully cleaned up. In the RPF the person receives counseling and does work on a team basis. The largest percent of persons assigned to an RPF graduate successfully and rejoin the crew. The majority of these give rave success stories. No other management organization undertakes such a function. They just fire people. This was a new idea. After formation of the RPF things then started to straighten out. The ship stands quite ready to accept people back off the RPF, fully handled, fully capable in life and valuable. The RPF also waits for anyone fouling up habitually and injuring ship and crew survival. The RPF is proving to be one of the most successful salvage actions ever undertaken. Any casualty from it simply was not fully handled case-wise. The rest are a howling success and I’m happy for them. 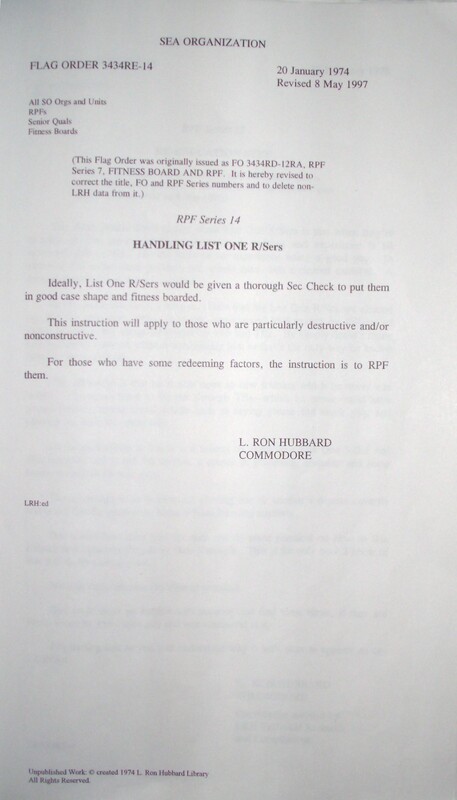 Ideally, List One R/Sers2 would be given a thorough Sec Check3 to put them in good case shape and fitness boarded4. This instruction will apply to those who are particularly destructive and/or nonconstructive. For those who have some redeeming factors, the instruction is to RPF them. 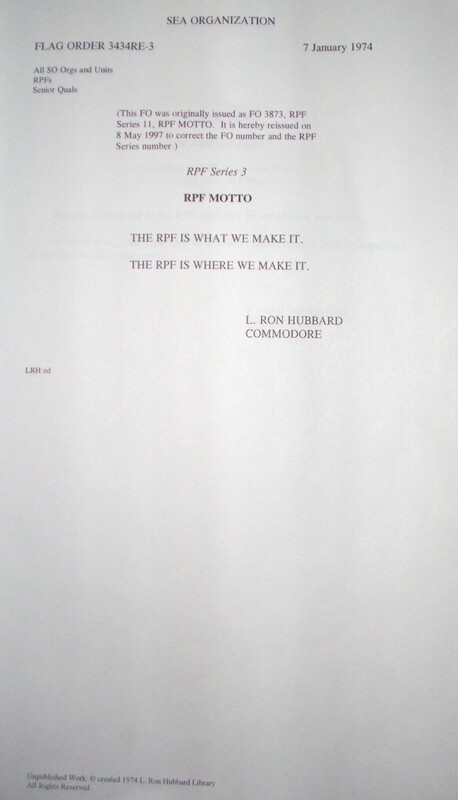 THE RPF IS WHAT WE MAKE IT. THE RPF IS WHERE WE MAKE IT. The RPF is organized around getting all such persons contributing through supervised Estates projects on a one-job, one-place, one-time basis, as well as getting through a technical program five hours per day. It is established under the Senior Qual of the continent, directly under the RPF I/C, in the Senior Correction Section. 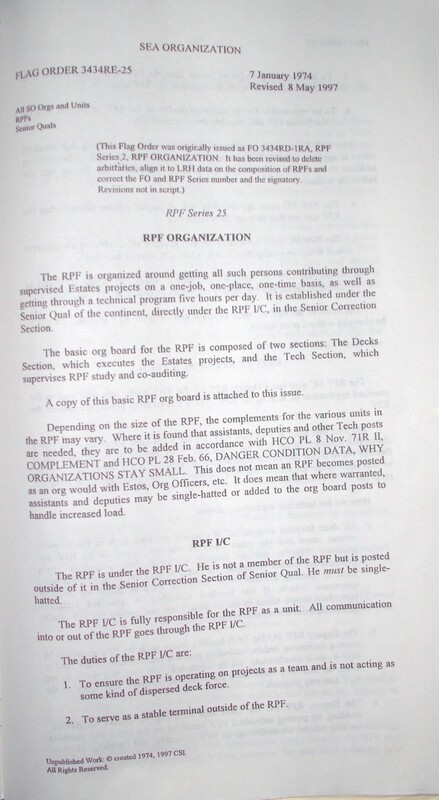 The basic org board for the RPF is composed of two sections: The Decks Section, which executes the Estates projects, and the Tech Section, which supervises RPF study and co-auditing. 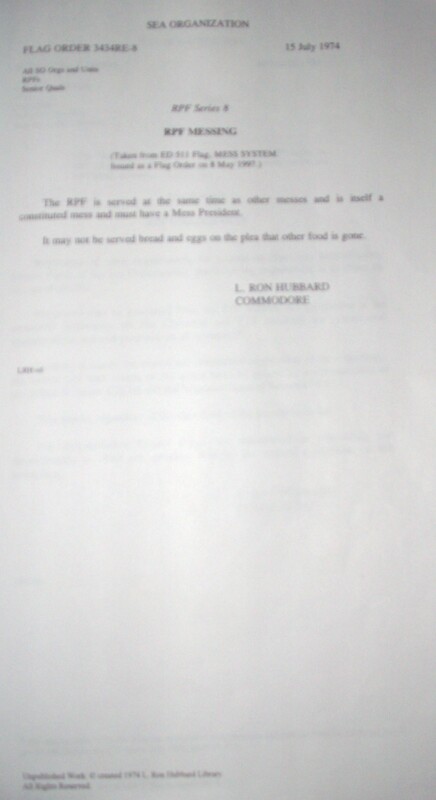 A copy of this basic RPF org board is attached to this issue. 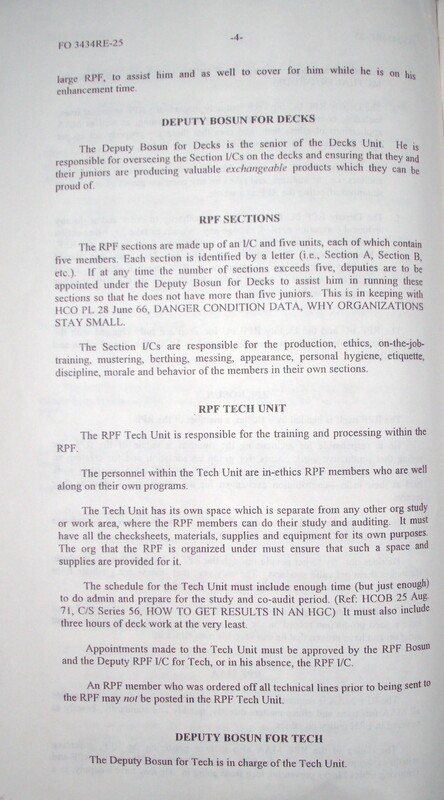 Depending on the size of the RPF, the complements for the various units in the RPF may vary. Where it is found that assistants, deputies and other Tech posts are needed, they are to be added in accordance with HCO PL 8 Nov. 71R II, COMPLEMENT and HCO PL 28 Feb. 66, DANGER CONDITION DATA, WHY ORGANIZATIONS STAY SMALL. 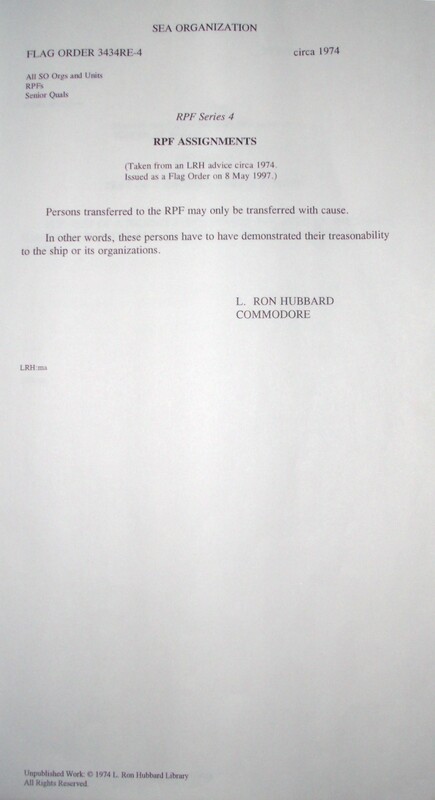 This does not mean an RPF becomes posted as an org would with Estos, Org Officers, etc. It does mean that where warranted, assistants and deputies may be single-hatted or added to the org board posts to handle increased load. The RPF is under the RPF I/C. He is not a member of the RPF but is posted outside of it in the Senior Correction Section of Senior Qual. He must be single-hatted. The RPF l/C is fully responsible for the RPF as a unit. All communication into or out of the RPF goes through the RPF I/C. 1. To ensure the RPF is operating on projects as a team and is not acting as some kind of dispersed deck force. 2. To serve as a stable terminal outside of the RPF. Unpublished Work: © created 1974,1997 CSI. 3. To act as the liaison for all comm from the RPF to any terminal outside the RPF and for all comm from outside the RPF into it. 4. To be responsible for the technical quality in the RPF, in liaison with the Cont Senior C/S who also has this responsibility. The RPF I/C also has very specific responsibilities for seeing that standard ethics is applied in the RPF to assure full redemption does occur. a. The RPF I/C must approve any and all justice actions taken within the RPF and see that they are fully on-policy. b. The RPF I/C must personally see and approve all conditions assignments and where any off-policy action is found it must be handled. c. Daily, the RPF I/C must do a complete inspection of the RPF and in doing so detect and handle any out-ethics or policy or FO violations. The hours of the RPF I/C must be made known to the RPF unit and are not to be changed without prior notice. 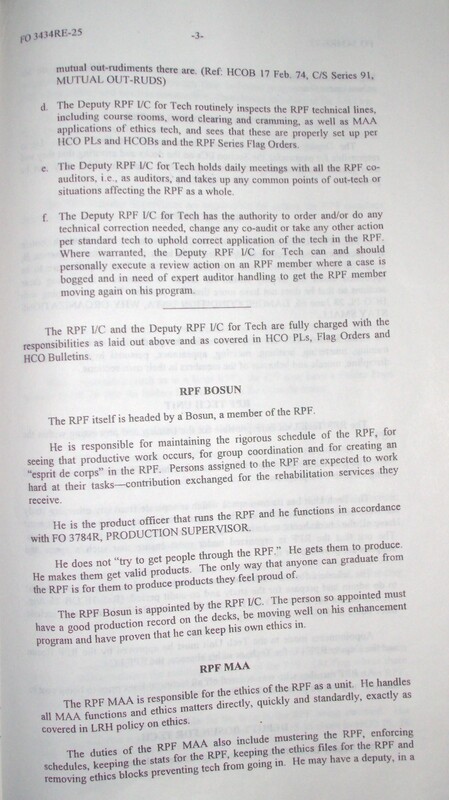 The RPF I/C also has a Deputy RPF I/C for Tech under him who sees to the standard application of tech in the RPF. He is posted from personnel outside the RPF. The fact that there is a Deputy RPF I/C for Tech does not change the stable datum that members of the RPF are to get each other through by co-auditing. He is there to see to it that this co-auditing is done thoroughly and is technically correct, so that each of the persons in the RPF achieves the full gains available from the program. b. The Deputy RPF I/C for Tech handles errors made by RPF members by issuing cramming orders, including retreads and retrains of the read-it, drill-it, do-it checksheets, where warranted. He sees that these do get done, so that they understand the technical materials that apply to the RPF auditing program. d. The Deputy RPF I/C for Tech routinely inspects the RPF technical lines, including course rooms, word clearing and cramming, as well as MAA applications of ethics tech, and sees that these are properly set up per HCO PLs and HCOBs and the RPF Series Flag Orders. e. The Deputy RPF I/C for Tech holds daily meetings with all the RPF co-auditors, i.e., as auditors, and takes up any common points of out-tech or situations affecting the RPF as a whole. 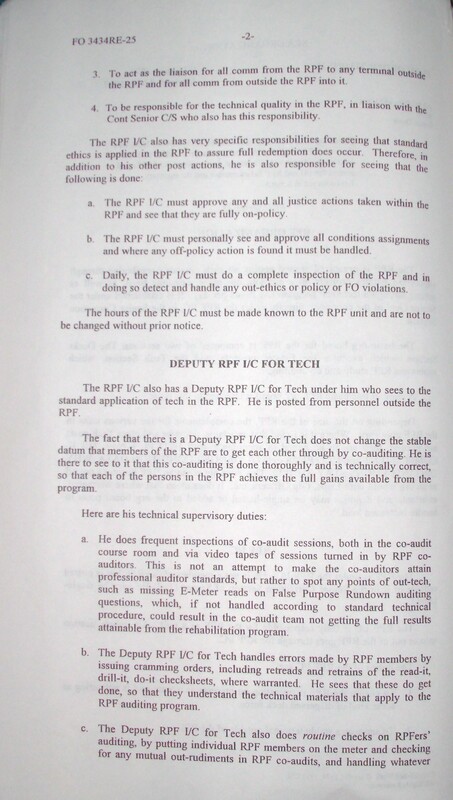 f. The Deputy RPF I/C for Tech has the authority to order and/or do any technical correction needed, change any co-audit or take any other action per standard tech to uphold correct application of the tech in the RPF. Where warranted, the Deputy RPF I/C for Tech can and should personally execute a review action on an RPF member where a case is bogged and in need of expert auditor handling to get the RPF member moving again on his program. The RPF I/C and the Deputy RPF I/C for Tech are fully charged with the responsibilities as laid out above and as covered in HCO PLs, Flag Orders and HCO Bulletins. The RPF itself is headed by a Bosun, a member of the RPF. He is responsible for maintaining the rigorous schedule of the RPF, for seeing that productive work occurs, for group coordination and for creating an “esprit de corps” in the RPF. Persons assigned to the RPF are expected to work hard at their tasks—contribution exchanged for the rehabilitation services they receive. He is the product officer that runs the RPF and he functions in accordance with FO 3784R, PRODUCTION SUPERVISOR. He does not “try to get people through the RPF.” He gets them to produce. He makes them get valid products. The only way that anyone can graduate from the RPF is for them to produce products they feel proud of. The RPF Bosun is appointed by the RPF I/C. The person so appointed must have a good production record on the decks, be moving well on his enhancement program and have proven that he can keep his own ethics in. The RPF MAA is responsible for the ethics of the RPF as a unit. He handles all MAA functions and ethics matters directly, quickly and standardly, exactly as covered in LRH policy on ethics. large RPF, to assist him and as well to cover for him while he is on his enhancement time. 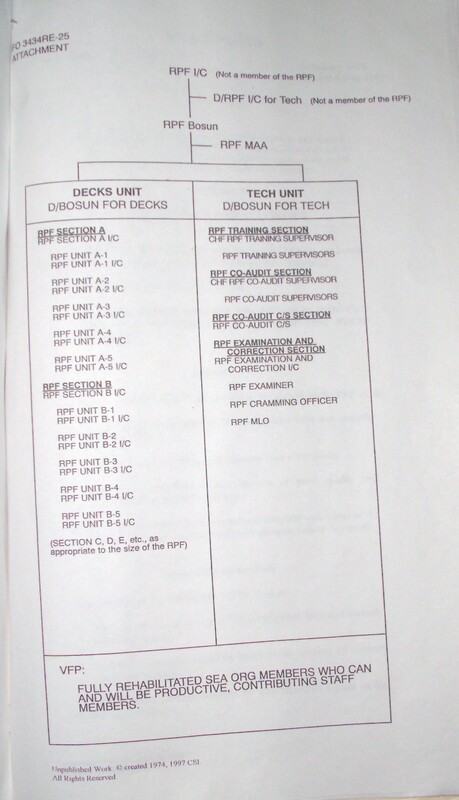 The Deputy Bosun for Decks is the senior of the Decks Unit. He is responsible for overseeing the Section I/Cs on the decks and ensuring that they and their juniors are producing valuable exchangeable products which they can be proud of. The RPF sections are made up of an I/C and five units, each of which contain five members. Each section is identified by a letter (i.e., Section A, Section B, etc.). If at any time the number of sections exceeds five, deputies are to be appointed under the Deputy Bosun for Decks to assist him in running these sections so that he does not have more than five juniors. 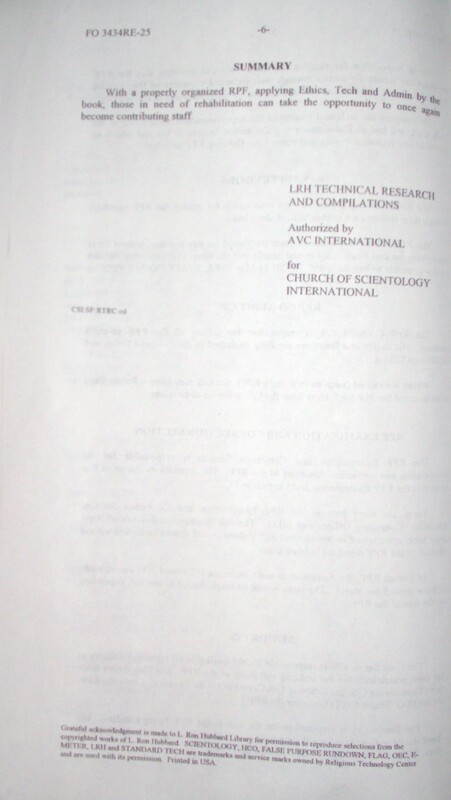 This is in keeping with HCO PL 28 June 66, DANGER CONDITION DATA, WHY ORGANIZATIONS STAY SMALL. The Section I/Cs are responsible for the production, ethics, on-the-job-training, mustering, berthing, messing, appearance, personal hygiene, etiquette, discipline, morale and behavior of the members in their own sections. The RPF Tech Unit is responsible for the training and processing within the RPF. The personnel within the Tech Unit are in-ethics RPF members who are well along on their own programs. The Tech Unit has its own space which is separate from any other org study or work area, where the RPF members can do their study and auditing. It must have all the checksheets, materials, supplies and equipment for its own purposes The org that the RPF is organized under must ensure that such a space and supplies are provided for it. The schedule for the Tech Unit must include enough time (but just enough) to do admin and prepare for the study and co-audit period. (Ref: HCOB 25 Aug. 71, C/S Series 56, HOW TO GET RESULTS IN AN HGC) It must also include three hours of deck work at the very least. Appointments made to the Tech Unit must be approved by the RPF Bosun and the Deputy RPF 1/C for Tech, or in his absence, the RPF I/C. An RPF member who was ordered off all technical lines prior to being sent to the RPF may not be posted in the RPF Tech Unit. The Deputy Bosun for Tech is in charge of the Tech Unit. He is responsible for running the Tech Unit and ensuring that the RPF members are standardly gotten through their technical programs so they can be fully rehabilitated and become constructive, contributing members of the Sea Org. He oversees the technical quality of the supervision and co-auditing in the Tech Unit, and has an Examination and Correction Section in his unit which he uses to ensure technical quality and correct any flubbing RPF member. The RPF Training Supervisors are responsible for getting the RPF members through their studies on a read-it, drill-it, do-it basis. The RPF Co-audit C/S is responsible for C/Sing all the RPF co-audit sessions. His duties and functions are fully described in the Co-audit Series and HCOBs on C/Sing. Where warranted (such as in a large RPF), the C/S may have a Folder Page so as to speed the line for folders from the C/S to the co-audit teams. 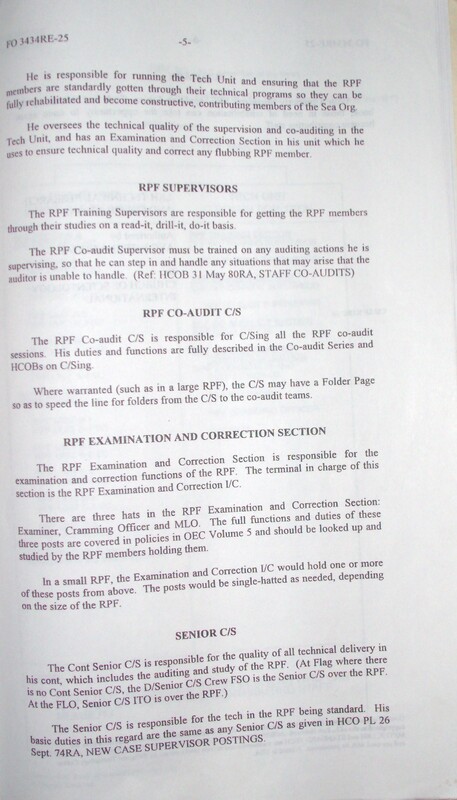 The RPF Examination and Correction Section is responsible for the examination and correction functions of the RPF. The terminal in charge of this section is the RPF Examination and Correction I/C. There are three hats in the RPF Examination and Correction Section: Examiner, Cramming Officer and MLO. The full functions and duties of these three posts are covered in policies in OEC Volume 5 and should be looked up and studied by the RPF members holding them. In a small RPF the Examination and Correction I/C would hold one or more of these posts from above. The posts would be single-hatted as needed, depending on the size of the RPF. The Cont Senior C/S is responsible for the quality of all technical delivery in his cont, which includes the auditing and study of the RPF. (At Flag where there is no Cont Senior C/S, the D/Senior C/S Crew FSO is the Senior C/S over the RPF. At the FLO, Senior C/S ITO is over the RPF. The Senior C/S is responsible for the tech in the RPF being standard. His basic duties in this regard are the same as any Senior C/S as given in HCO PL 26 Sept. 74RA, NEW CASE SUPERVISOR POSTINGS. With a properly organized RPF, applying Ethics, Tech and Admin by the book, those in need of rehabilitation can take the opportunity to once again become contributing staff.